This summarises about 10 articles on Islam that I published before I created this blog. The Islamic Council of Europe published this, the output of a working group following a conference held at the Albert Hall in 1980 on the theme ‘Message of Muhammad’. Adopted and Issued at the Nineteenth Islamic Conference of Foreign Ministers in Cairo on 5 August 1990. On 30 June 2000, the Organization of the Islamic Conference officially resolved to support the Cairo Declaration on Human Rights in Islam. Both of these declarations state that their foundation is Shariah Law. In effect, “you have permission from Allah to do certain things, and duties imposed by Allah to do certain other things”. Article 6 of the Cairo Declaration on Human Rights in Islam includes: “Woman is equal to man in human dignity, and has rights to enjoy as well as duties to perform …” and “The husband is responsible for the support and welfare of the family”. It is careful not to say that women have equality. Women are treated as second class people in Islam. This is not a modern-day cultural bias, but something written into Islam from the start. Cherie Blair infamously said “It is not laid down in the Koran that women can be beaten by their husbands or that their evidence should be devalued, as it is in some Islamic courts”. What a pillock! It really is important to read the Islam texts, and not believe what you are told! Koran Sura 4 verse 34 describes the conditions in which a husband may beat his wife. Koran Sura 2 verse 282 says: “… get two witnesses, out of your own men, and if there are not two men, then a man and two women …”. And also Koran Sura 4 verse 11 describes a law of inheritance: “… to the male, a portion equal to that of two females …”. See also: “Lessons in how to beat your wife“. Neither the Koran nor the Haddith mandate Female Genital Mutilation, nor the wearing of the Burqa, the Niqab, or even the Hijab. But in a religious environment where women had equality (if such exists), would these practices still exist? Islam is not excused. “Islamophobia” ought to mean “an irrational fear of Islam”. In fact, the word is often applied to critical attitudes towards Islam that are not based on fear, and which are often rational and relevant. There is little doubt that the purpose is often censorship of unwanted criticism of Islam, by branding the critic as suffering from Islamophobia. Sometimes the evaluation of Islamophobia is based on shoddy analysis by the Runnymede Trust. The above page gives a commentary, and also reverses the analysis to form an illuminating test for Infidelphobia, the attitudes of Muslims towards non-Muslims. Islamic what? It is there, but never mainstream. Anti-Islam humour is common, of course. 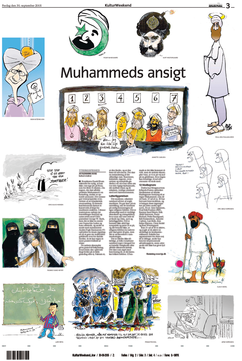 Like many others, when the Jyllands-Posten Muhammad cartoons became topical, I captured them onto my PC so that they could not be erased. I will not publish them myself. Very few Muslims would attempt harm, but it wouldn’t take many followers of the “religion of peace” to kill me or burn my house down. Anti-Jewish cartoons are common in Islamic countries. These pages attempt to describe how Muslims could behave without problems in the UK. Many do so, of course. But there is a steady drip-feed of cases that display incompatibility between some practices of Islam and UK law and culture. The desire of many Muslims for Shariah Law, and antagonism towards UK norms, are obvious examples. The fundamental flaw in such campaigns is that they fail to acknowledge what is blatantly clear: Islam inherently has serious problems. These campaigns typically act as though the problem lies with those who view Islam with suspicion, and that this can be countered with spin and gloss. But Islam “in its natural state” is currently at best medieval, (for example, its typical attitude towards science), and at worst intolerant and barbaric, (for example, various aspects of Sharia Law including attitude towards women, intolerance towards other religions, and immature and exaggerated reactions to criticism). Individual Muslims may be far more enlightened than Islam itself, of course! But it is clear that even within the UK there is the full spectrum from integrated to unintegrated, and from enlightened to unenlightened. Islam-is-Peace only speaks for part of this spectrum, the relatively integrated and enlightened subset. But non-Muslims have to live with, and take into account, the whole spectrum! “I believe in social justice. So did Muhammad”. “I believe in women’s rights. So did Muhammad”. “I believe in protecting the environment. So did Muhammad”. (It can validly be claimed that Muhammad had some policies that were an improvement on the pre-existing policies at the time. But that was over 13 centuries ago! Islam in its natural state, identified by the Koran and Hadith, is incompatible with Universal Human Rights and incompatible with the 21st Century). It is important for all concerned to separate the very different concepts of “criticism of Islam” and “hatred of Muslims”. A corollary is that Muslims should not treat criticism of Islam as an attack on themselves. But many of them do, perhaps because their personal identity is often strongly bound to their religion. There are many reform movements which have the aim of pulling Islam towards enlightenment and the 21st Century. See: Islam – summary and index.